Our Most Popular ESD Floors! Nylon Reinforced, SUPER High Bond Strength. The most aggressive tape in the World! United SCP's Siga Contact Tape is a nylon fiber reinforced, VOC free acrylic cement film adhesive provided in roll form. Its ease of use and super aggressive nylon reinforced bond make it a perfect replacement for difficult to work with solvent based contact cements. Typical contact adhesives require wait times and generate a substantial amount of odors and VOC's. The associated fumes can be combustible and cause headaches while coming into contact with the liquid adhesive may cause skin irritation and chemical burns. Siga Contact is fast and easy to use and it�s reliable no odor aggressive bond securely anchors a multitude of materials to otherwise difficult to adhere substrates. Siga Contact may be applied off site! Simply apply the adhesive to the material, leave the liner in place and peel and stick it to the substrate upon arrival. Siga Contact is useful in diverse manufacturing environments including the construction of Mobile labs, Aerospace Structures, Heath Care Flooring Installations (for adhering wall base and flash coving) and more. NO Odor and VOC Free. Fast, safe and environmentally friendly. EXCELLENT for anchoring sound proofing, padding and insulation to ceilings and walls. Perfect for use when installing Titanium ESD Sheet Vinyl using our URAS "peel and stick" installation method (use as a perimeter tape). Outstanding for flash coving vinyl up walls or applying transition strips to carpet and concrete. Installation Overview: Substrates must be free of contaminants that may compromise bond strength. The substrate must further be dust and oil free and permanently dry. If going over concrete, moisture emissions are not to exceed 3.0 lbs per 1000 sq. ft. in 24 hours (via Cal Chloride test method). 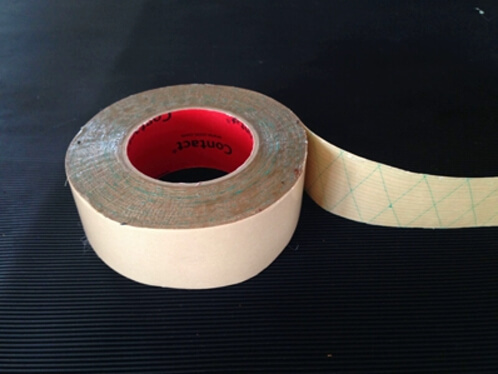 Unroll Contact Tape (adhesive side down) on substrate, smooth in place. remove top liner, place item on exposed adhesive and and press in place.